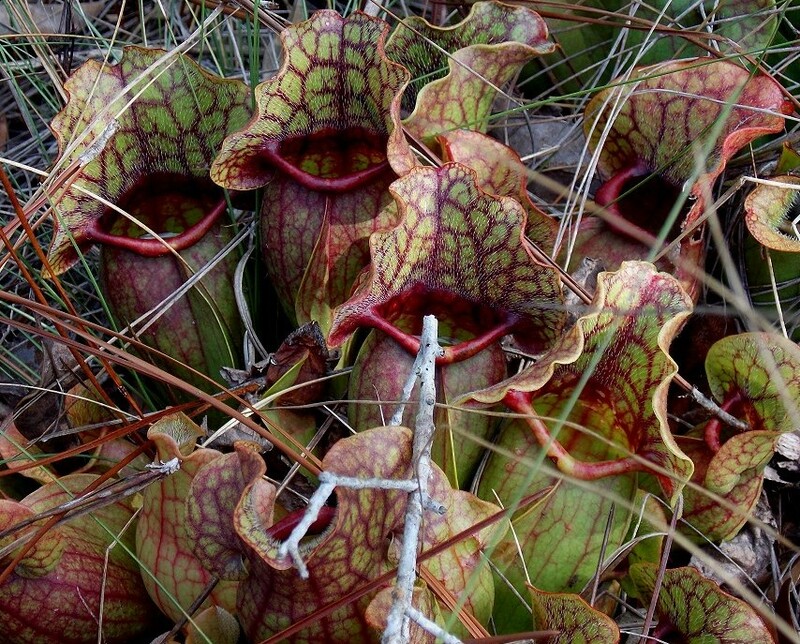 Sarracenia rosea at the site in Pensacola, FL; staying put. Photo by Mark Todd. The NASC is happy to report that after conversations with Escambia County, FL environmental management officials and with our understanding of the current status of the properties where the plants would have been sourced from, we are confident that the plants are not under any immediate threat. While the properties do remain for sale and could be developed by the potential new owners, any development on the property must go through rigorous permitting and approval at the county level and we are thoroughly impressed with Escambia County's commitment to the retention of wetlands and threatened and endangered species within them as a public good. This means, of course, that the great news is that the NASC is confident that the plants will be able to remain on the properties in their original habitat, which is one of our primary goals. Thus the relocation of all of the plants from this site in Pensacola to other nearby preserve lands as planned for January 4-6, 2013 is cancelled. When we were first planning this rescue, we knew that transplanting 5,000 plants would be a huge undertaking, and with such short notice we worried that we wouldn't have enough volunteers to do the work. Imagine our delight when dozens of volunteers stepped forward, willing to travel from far and wide to save these amazing plants! This would be a relocation and reintroduction mission like nothing ever before. We are extremely grateful for all the work, effort, and planning that all our volunteers all have done, and we apologize for any inconveniences that this cancellation may have caused. The simple fact that our volunteers were willing to "stand up and be counted" was vital to this effort, and we're happy to have made so many new acquaintances and soon-to-be friends. I think we have sent a strong message, that we care very much about these amazing plants, and that we want to ensure that future generations will be able to see them flourishing in their natural habitat. Finally, there will always be other opportunities and we certainly have other projects we have been working on concurrently. And we are always looking to add unique genetic lineages to our grower's program for propagation and potential reintroduction. On that point, we're hoping to gain approval from Escambia County to collect a sample of the plants on the properties at Pensacola to enter into our grower's program for rapid propagation by rhizome and genetically pure seed specific to that site. In a few years we would be able to produce enough plants to honor our commitments to the Weeks Bay Foundation and The Nature Conservancy and provide them with plants propagated from stock collected from the original site for their reintroduction efforts in our collaboration with them. Thank you to all our volunteers, from the bottom of our hearts, once again. We hope everyone has a very happy New Year! Mark is still receiving volunteer e-mails regarding our planned rescue at the Pensacola site. We're so pleased with your outpouring of support and generosity! Mark reports that the NASC volunteers will be responsible for replanting plants at TNC sites. Also on the rescue planning: We still need to receive the three liability waivers and the confidentiality agreement from all volunteers! Board members discussed logistics of the rescue and travel plans. All seems to be coming together. Our NASC t-shirts (available in our store) were ordered to be available on site for purchase from volunteers. Other shirts will be given away as a thank you gift; Shane will finalize these shirt orders. Our next election will be held on Thursday, January 17, 2013. Nominations for any position will be accepted until 9 PM Eastern on 1/17/2013 at the election meeting. Nominations can be made by e-mailing Yann Rodenas at [email protected]. Ryan will finish the 2012 fiscal auction e-mails noting total donated for tax purposes. We will have a special meeting on Saturday, 12/22/2012 at 9 PM Eastern to discuss plans for the upcoming rescue and relocation. An article was published regarding the Pensacola rescue.